Media reports, political statements, and social media debates on the refugee/migrant crisis shape the ways in which people and societies respond to those displaced people arriving at their borders world wide. These current events are framed and experienced as a crisis, entering the media, capturing worldwide political attention, and producing diverse and contradictory discourses and responses. The labels “migrant” and “refugee” are frequently distinguished and conflated in traditional as well as social media when describing the same groups of people. In this paper, we focus on the simultaneous struggle over meaning, legitimization, and power in representations of the refugee crisis, through the specific lens of Twitter. The 369,485 tweets analyzed in this paper cover two days after a picture of Alan Kurdi - a three-year-old Syrian boy who drowned in the Mediterranean Sea while trying to reach Europe with his family - made global headlines and sparked wide media engagement. More specifically, we investigate the existence of the dichotomy between the “deserving” refugee versus the “undeserving” migrant, as well as the relationship between sentiment expressed in tweets, their influence, and the popularity of Twitter users involved in this dichotomous characterization of the crisis. Our results show that the Twitter debate was predominantly focused on refugee related hashtags and that those tweets containing such hashtags were more positive in tone. 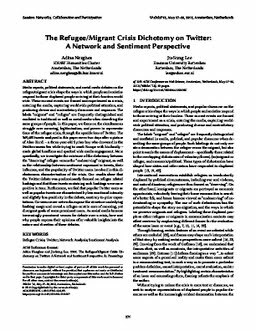 Furthermore, we find that popular Twitter users as well as popular tweets are characterized by less emotional intensity and slightly less positivity in the debate, contrary to prior expectations. Co-occurrence networks expose the structure underlying hashtag usage and reveal a refugee-centric core of meaning, yet divergent goals of some prominent users. As social media become increasingly prominent venues for debate over a crisis, how and why people express their opinions offer valuable insights into the nature and direction of these debates.